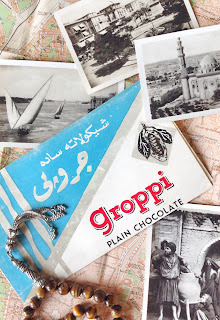 "The important thing is GROPPI's"
Not so long ago Groppi's Café was once 'the place' to go in Cairo for tea, pastries and chocolate. 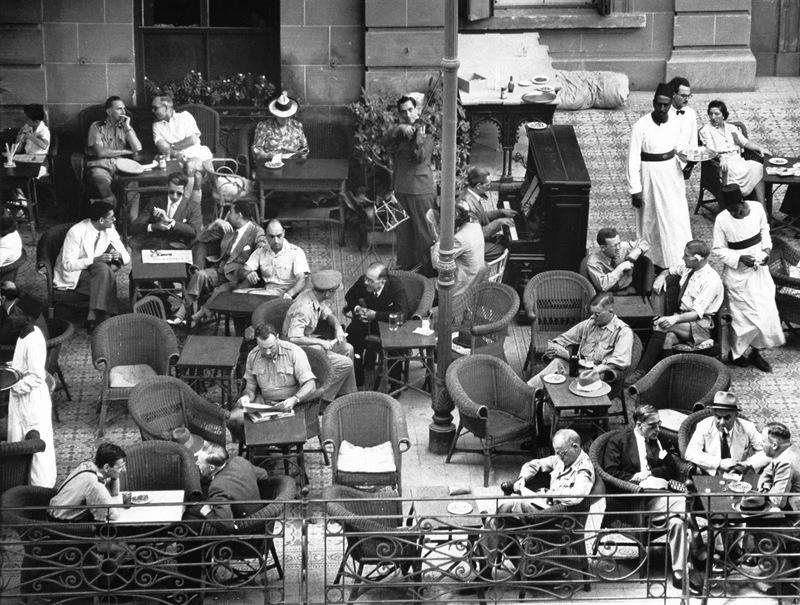 When Cairo was the place to be seen, Groppi's was the café to be seen in. Such was its place in the social merry-go-round that everyone from Kings and Queens to politicians and members of the social elite passed through its doors to sample its legendary delights. Today, the café still occupies two sites in downtown Cairo. 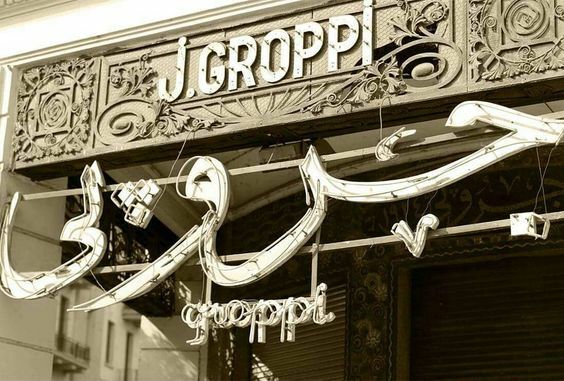 The first opened for business on 23 December 1909 on Sharia al-Maghrabi (today: Adly Street) and was generally known as Garden Groppi's. 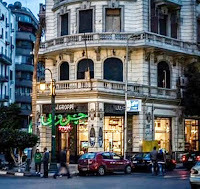 The second followed on its success and opened in March 1925 on a corner of Midan Soliman Pasha (today: Talaat Harb Square) opposite the Savoy Hotel, long after the British Military had vacated its war-time headquarters in the requisitioned hotel. 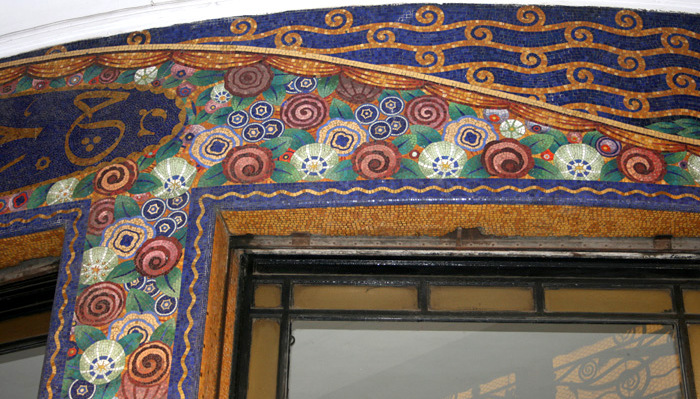 This branch has become a downtown landmark with its art deco tiled exterior and neon signage, with distinctive multi-coloured mosaics in the entrance executed by the Venetian artist, Antonio Castaman, and an eclectic interior by leading designers of the day. 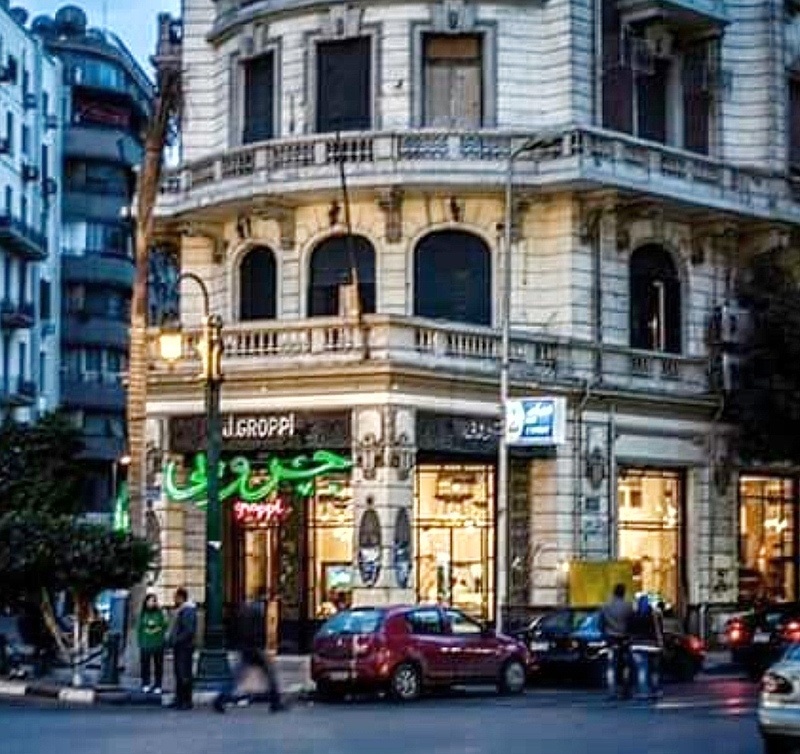 The Adly Street premises became a favourite haunt of T.E. 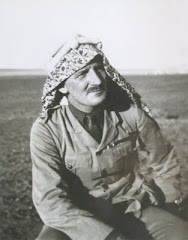 Lawrence long before he was sent out to the Hejaz as an advisor to the Emir Feisal. Every day for nine months, he and Stewart Newcombe would have passed the café on their way by bicycle to-and-from their lodgings at the Grand Continental Hotel to the Military Intelligence offices based in the Savoy, a short journey of some five minutes. 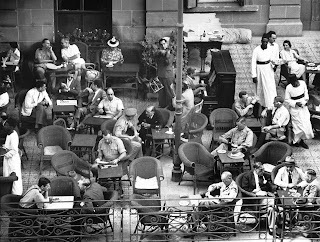 With breakfast taken in the sumptuous dining room of the Continental, the two men would undoubtedly have frequented the café during the day, the cool enclosed garden offering a peaceful sanctuary from the hustle and bustle of the Savoy offices. 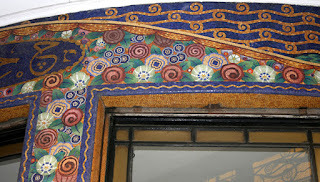 Conveniently, the café provided two exits, one through the shop and one through a door set in the wall of the garden. For operatives with secrets to divulge and enemies to evade, this was an added advantage. 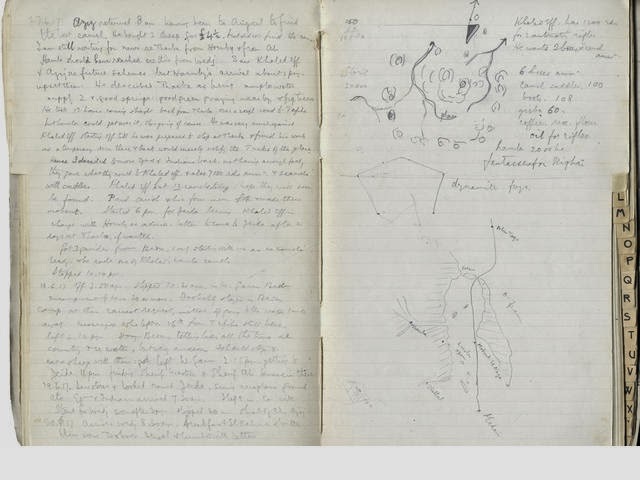 At some time in late 1925 - the letter is undated - Lawrence wrote to his biographer, Robert Graves who was en route to Egypt, explaining that he had spent three magnificent years in Cairo and only ever went twice into a club. But what stood out for him most was Groppi's: "The important thing is GROPPI's, the Tea-garden shop," he wrote, emphasising its significance by the use of capital letters, "and the drink is iced coffee. Straws the process. 2 piastres the means. The children will love Groppi's. Chocolate all right, too: but not in summer." 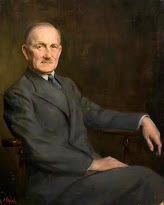 Based on Lawrence's recommendation Graves' children would probably have enjoyed Groppi's but Egypt did not appeal to Graves and he left his posting as Professor of English Literature at the Egyptian University at Cairo at the end of the first academic year. 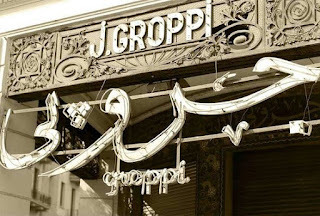 In March 1925, Groppi opened its second branch opposite the Savoy Hotel. One suspects that Lawrence's abhorrence of 'clubs' held no sympathy for Newcombe who would have felt most at home in either the Gezira Sporting Club or the Turf Club - those two great institutions beloved by staff officers wearing suede desert boots and brandishing fly whisks and swagger sticks. 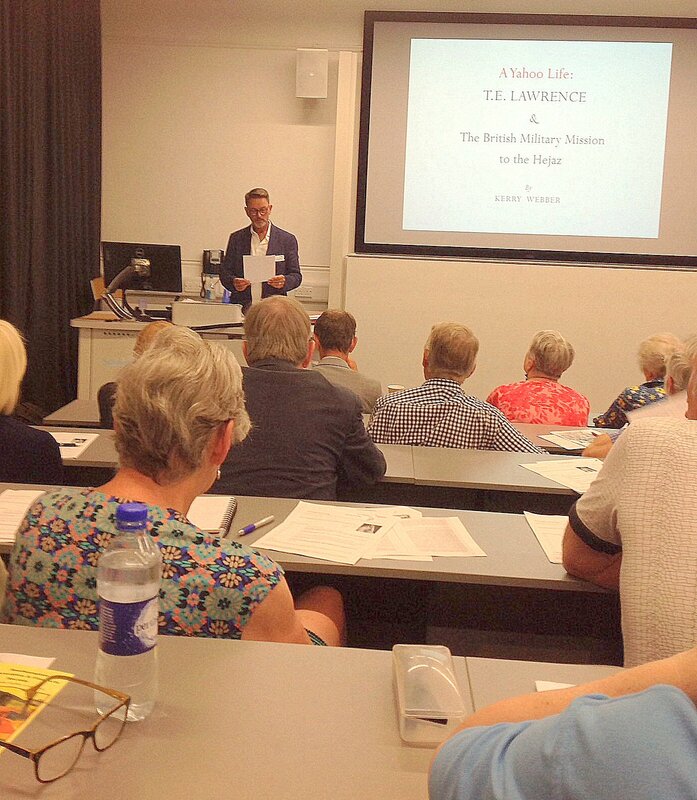 Further evidence of Lawrence’s fondness for Groppi’s is shown in the introduction to Clare Sydney Smith’s story of her friendship with him, entitled The Golden Reign. I remember he was quiet and withdrawn and had a shock of untidy-looking hair, but beyond that he made no impression on me at all. After tea Sydney drove him home, and when he came back he said: "Do you realize who that was?" "It was Lawrence of Arabia!" "And what's more, he's asked us to go to tea with him to-morrow." During the Second World War, Groppi’s retained its reputation as one of the few smart places open to everyone regardless of rank, although its exorbitant prices tended to mostly attract the officer class. It was said the garden was a favourite of General Montgomerie who came to enjoy the regular jazz evenings. Stage shows were a regular feature throughout the Forties. When the musicians stopped playing well into the evening and the dancers had returned to their tables, the floor would then be hydraulically raised two feet to become a stage for the floor show which often featured some very accomplished performers. 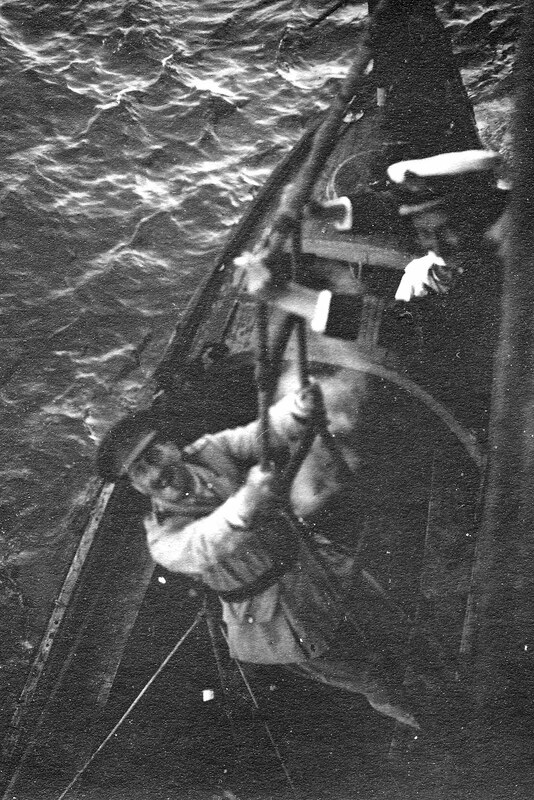 An officer in the Special Boat Service, Colonel David Sutherland, famously entertained two German prisoners to ice-cream sodas in Groppi's before handing them over for interrogation. 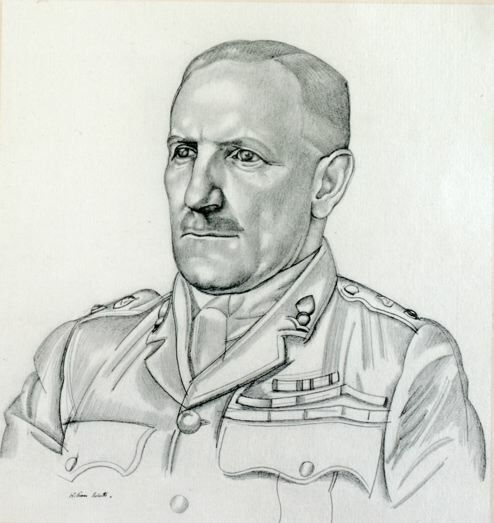 It was said his act of hospitality was unappreciated in certain quarters but in his defence he pointed out to an exasperated brigadier that as it was so rare for the SBS to take prisoners alive during missions in enemy territory he saw no harm, especially as one of the men had been captured with the Wehrmacht's new self-loading rifle, a weapon years ahead of its time and of particular interest to the boffins in Cairo. No matter how full, the flowering creepers that had by now been trained up the garden walls created an illusion of intimacy and a haven of peace in the midst of the bustling city. Such an atmosphere gave rise to more than just the promise of welcome refreshment. 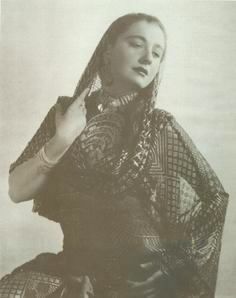 The writer, Artemis Cooper, who taught English at the University of Alexandria, recalls how pashas came to sip freshly roasted coffee and eat cream cakes with their Levantine mistresses who draped their furs over the chairs while discreet waiters shuffled silently on the sandy floor wearing long white galabiehs topped with red tarbushes. “Officers on leave,” she revealed, “looked out for female companionship, and envied the man at the opposite table who suddenly rose to his feet with a smile, and pulled out a chair for the woman who had just joined him.” Then, as dusk fell, strings of coloured light-bulbs illuminated the garden adding to the possibility of intrigue and romance for the clientele who at that time in Egypt was mostly under the age of thirty. 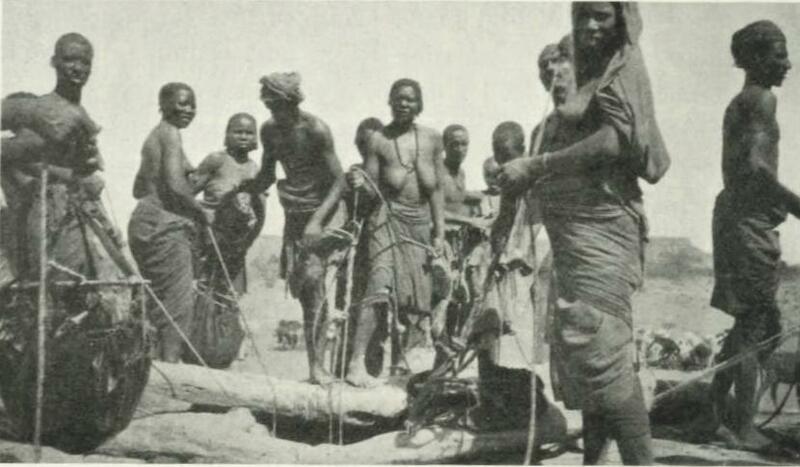 While the 1920s witnessed the ultimately unsuccessful hunt for the lost oasis of Zerzura in the Western Desert - a mythical city that had long excited the imagination with tales of verdant palms, a ruined city and lost treasure - it at least alerted one of the region’s most famous explorers, Count Laszlo Almásy, to a way of smuggling two German spies into Cairo. 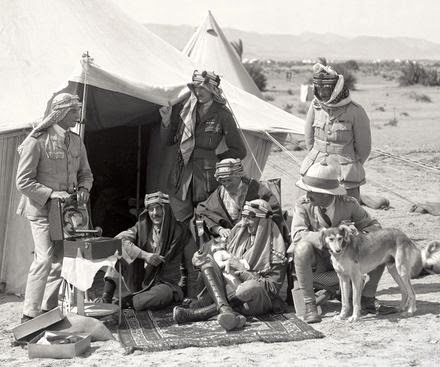 Almásy may have known the ways of the desert but he clearly underestimated the British spy-master, Major A.W. 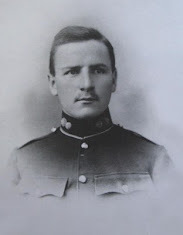 Sansom, of the British Security Services in Cairo. 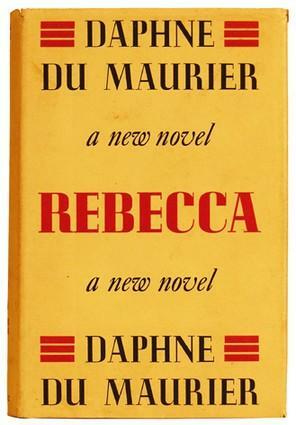 Sansom’s interest was first aroused when a copy of Daphne de Maurier’s novel Rebecca was found among the belongings of two German wireless operators in a remote desert W/T station which had been captured in May 1942, the significance being that the men could not read English. 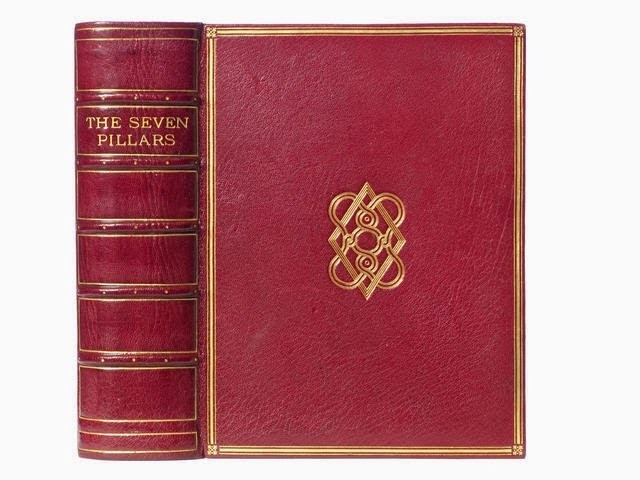 A rubbed out price mark of ’50 escudos’ indicated the book had been bought in Portugal and Sansom’s network of agents soon discovered that six copies of the book had been bought on the same day in a Lisbon bookshop by the wife of a staff member from the German Embassy. The book was clearly being used to encode and decode wireless messages. Almásy’s two hapless spies, Hans Eppler and Gerd Sandstede, were finally undone when their Egyptian money ran out and they began to off-load forged five pound notes onto the black market in the belief that their value would plummet the closer Rommel approached Cairo. Their dissolute and desultory lifestyle was funded by over 3,600 pounds worth of dud fivers lavishly spent not just in the usual fleshpots like the Kit Kat Club, the legendary cabaret venue, but in more sedate establishments like Groppi’s where suspicions were raised and brought to Sansom’s attention. Their friendship with the sultry Hekmat Fahmy, known as the belly dancer spy, further sealed their fate and the three were surrounded in a dawn raid on their luxurious houseboats on the Nile. Eppler contrived a getaway by rolling up his socks and throwing them like hand grenades to slow down Sansom's men. But the game was up and they were apprehended. During the infamous Cairo riots that took place on 26 January 1952, both the Gezira Sporting Club and the Turf Club – the latter situated almost opposite Groppi's garden entrance on al-Maghrabi Street – were firebombed and totally destroyed. On what has been called Black Saturday, a series of anti-British and anti-Western riots spread throughout the city targeting banks, shops, theatres and hotels. 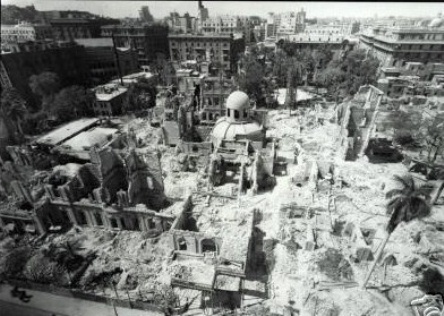 Even the iconic Shepheard’s Hotel was not spared, along with the destruction of 12 other hotels, almost 300 shops and department stores, 40 cinemas and even the Cairo Opera House. Within a few hours thousands of local workers were displaced while the perceived symbols of seventy-years of British rule were razed to the ground as the incendiary fervour of revolution swept throughout the capital. Despite President Nasser’s attempts to nationalise foreign owned businesses the restaurant remained Swiss-owned and enjoyed something of a revival during the next two decades, becoming the caterer of choice for presidents and kings and thereby escaping the rigid hand of privatisation. The window displays at the Talaat Harb branch were famed for their creativity during Christmas and Easter festivities, earning praise for the restaurant as Cairo's answer to London's Fortnum and Mason's. In 1971, the café provided the catering at the inauguration of the Aswan High Dam, an enormously ambitious project at the heart of Nasser’s economic vision. Five-hundred guests attended an extravagant party that included heads of state from other Arab countries as well as soviet leaders, since the Soviet Union had funded the project. But already the trends in catering had shifted and competition came from an unexpected direction. With the opening of the first Wimpey’s in Cairo in the mid-70s, the burger restaurant quickly became the place of choice for young modern Cairenes and was where you took your girlfriend if you wanted to treat her. The old world charm of Groppi’s, with its ice-cream smothered in Chantilly créme, marrons glacés and chocolate covered dates, gave way to the brash plastic and bright lights of the first of the fast food giants to hit the town. Egypt had changed and Groppi’s was just one of its anachronistic casualties. Groppi's fortunes have been mixed during the past one hundred years of trading and having survived social upheavals, riots, bomb blasts and financial downturns it survives today by reputation only. The current owners are fighting back and are using social media sites to promote its history and products to a younger generation while older clients remain steadfastly loyal, sometimes against all the odds. 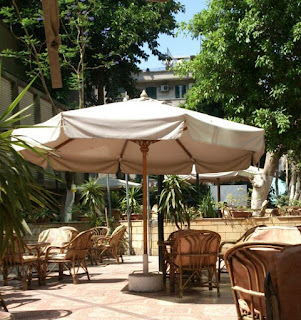 But if you are strolling in Cairo and want to soak up some of the atmosphere of a bygone era, Egypt's Belle Époque, then take a table at Garden Groppi’s and let your imagination wander. You’ll have plenty of time. Your waiter, no longer wearing the galabieh and tarbush, will not rush to serve you. Having seen off revolutions and fast food establishments, life moves at a different pace at Groppi’s and you would be wise to sit back, relax, and wonder who might next come through those famous doors.